Cindy Olah IS HAPPY TO BE OFFERING A 200 HOUR, YOGA ALLIANCE CERTIFIED, TEACHER TRAINING PROGRAM at Sacred Garden Yoga. YTT OPEN HOUSE- Date coming soon! If you are interested in finding out more about our teacher training, please join us for our YTT open house. We will answer any questions you may have about our program so that you can make sure it is right for you. We look forward to seeing you! 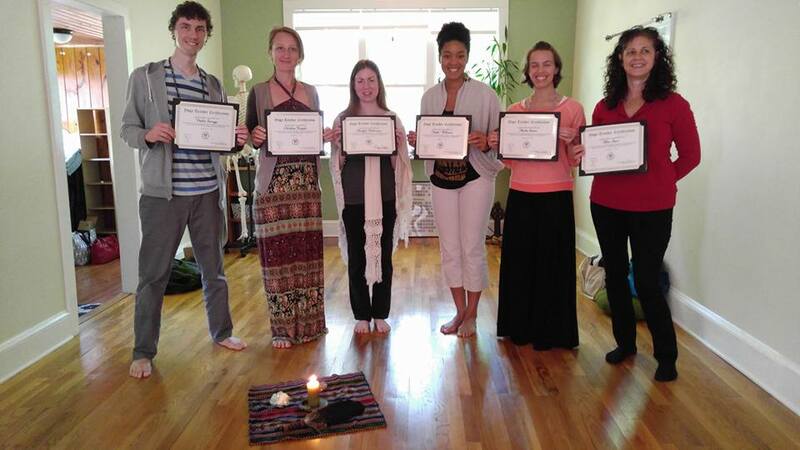 If you want to experience a profound learning and life changing course, amongst a group of supportive and like minded individuals, then perhaps you should consider our teacher training program. We aim to provide a safe and enriching environment, for you to deepen your practice, so that your own inner teacher can naturally unfold. Cindy Olah, owner of Sacred Garden Yoga, will be the main course leader, with other wonderful teachers also contributing their wisdom and knowledge for an enriched learning experience. Cindy has been a long time yoga student and teacher. Her practice has lead to insight allowing her to blend universal ideals with daily life. Through years of study and refinement, Cindy’s teaching style integrates alignment of body, mind and especially heart. Her intent is to share this gift so that others are inspired to awaken their inner teacher. A well rounded foundation will be provided, so that students feel confident in also sharing the wonderful gift of yoga to others. Students will have an understanding of the anatomy of the physical body, kinesiology, and be able to implement what they learn in the postures. Students will know the anatomically correct position of the musculoskeletal system and how the asanas function to create stimulation of the physical and mental body. Emphasis on setting a strong foundation first & teaching the proper engagement of muscles, to align bones and joints correctly, for each pose. We will be going into details of how to integrate and also extend out through the muscles and bones to enhance the prana flow in the body. The students will be able to articulate the importance of alignment and how through the asanas, they are also aligning to the bigger energy that brings forth healing, health and over all well being. Students will be able to teach proper alignment principles and also recognize misalignments so that they can help their students express their poses in a safe and enhancing way. As we go through the asanas, we will be strongly emphasizing the therapeutic benefits of the postures. Students will learn how physical practice and breath effect each of the body’s systems and how to use the poses to create therapeutic benefits for overall well being. The students will learn how to effectively warm-up, climax, cool-down a class and what poses to use for each. They will learn how to effectively use poses to build up and prepare for more difficult postures for the safety and happiness of their own students. The students will also be taught how to weave in meaning to a yoga class and how to use said meaning to help their students more deeply feel their practice. Students will be confident in their understanding of the body’s energetic system and how our physical and emotional states effect the flow of Prana. They will understand how the physical body reflects the state of the energetic body and how to use asana, breath and thought to create balance in both. The amount of yoga philosophy and metaphysics out there is so mind blowing, that there is only so much that can be covered in a 200 hour training. However we will begin to delve into the Sutras, the Bhagavad Gita, Shiva/Shakti and the deeper meaning of our practice as being an unfoldment of consciousness and bliss. The personal practice of each student will be strongly emphasized in the training. It is through their personal practice that the students will be able to internalize what they are learning. What they feel in their body, they will be able to articulate and teach more clearly to their own students.We will also be offering many opportunities, throughout the training, for students to have hands on practice in teaching each other in the classroom. The students will then feel more ready to teach their own class with more confidence. This course is not just for those interested in teaching! Yoga of the Heart is for anyone interested in deepening one’s practice, expanding self awareness and integrating knowledge into experience. A $150 nonrefundable deposit will reserve your spot . If you would like to apply for our program, please download the SGY YTT Application here. Once you decide our training is right for you, a non-refundable deposit of $150 is required to reserve your spot.